Nashville Camerman Craig Goodale traded country for cacti as he joined forces with GTT DP Dan Lowrey in Phoenix, AZ. 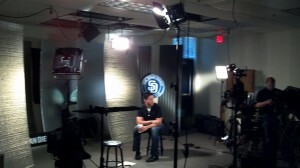 Fox Sports teamed with Go To Team to shoot footage of the San Diego Padres at spring training. Gear included the Panasonic HDX900 x 2, and the Canon 5D DSLR.